California. Pick your image. From movies, books, tabloids and every source imaginable, no place has been written about, dreamed of and experienced more by young and old, rich and poor and good and bad than the State of California. It is more diverse geographically and culturally than any state in the Union. It is the birthplace of American Cinema, Sixties Counter Culture and one of the greatest wine producing regions in the world. California has given us the Beach Boys, The Doors, Silicon Valley and Frank Gerry. Yes, California has it all - from the sublime to the utterly ridiculous. Traveling in The Golden State is, more or less, like a Hitchcock Film - You know you are going to be delighted and scared and you cannot resist it. If you don't think you can get scared in California, just get lost in South Central LA at night! LA - City of Angels Or Insanity On Parade? Landing at LAX, you can see The Theme Building. According to Wikipedia "It opened in 1961, and is an example of the mid-century modern influenced design school known as "Googie" or "Populuxe." The distinctive white building resembles a flying saucer that has landed on its four legs. It was designed by a team of architects and engineers headed by William Pereira and Charles Luckman, that also included Paul Williams and Welton Becket". 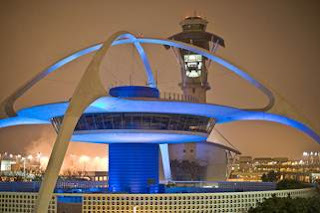 This iconic building gives one the sense of the futuristic promise of Los Angeles. Given the current state of affairs in California, that is a very tough sell. There is diverse and then there is just cultural rot. The only real good thing about LA is the weather. And even that can be hard to come by, given the pollution and environmental disaster that man has wrought in this city of thirty seven million. To put it another way - LA has an average of 7,000 lost souls per square mile! Even if you are not good at math - you get the picture. I am convinced the angels finally left this year when they passed a law against throwing a frisbee on the beach! To paraphrase Dennis Miller - LA is what happens when morons take over. From the twelve lane highways to the endless panorama of "ugly little boxes" in moribund subdivisions, LA, for me, only exists as a forced layover to somewhere else. Even though my stays in LA have been, by design, short, I can attest that there are architectural jewels hidden away in various areas. Because The Left Coast has always embraced American design innovation, many iconic architects have worked there , including such luminaries as John Lautner, Frank Lloyd Wright, Rudolph Schindler and Richard Neutra. All ground breaking innovators who paved the way for the what the current architectural press refers to as Mid Century Modern (MCM). During a brief stopover in the boiling pot, I happened upon an amazing house designed by ground breaking architect John Lautner. Driving around LA, I literally stumbled upon The Wolff House. Built in 1961, this cliff hanging house in the Hollywood Hills was being renovated and I was afforded a rare opportuniity to walk through a work of art in progress. After spending about three hours freely wandering, I came away inspired and somewhat intimidated by what was clearly a masterpiece by one of the true masters of modern residential architecture. Unfortunately, you can only view the house from the street today, unless you are brave enough to knock on the door and ask to take a peek. Other must sees of great design include The Ennis House and La Miniatura (Alice Millard House) by Wright and The Pavilion For Japanese Art by the fantastical organic architect Bruce Goff. And no trip to Los Angeles can be considered complete without a visit to The Getty Center, designed by Pritzker Prize winning Architect Richard Meyer. The experience of riding the quiet, pristine monorail up to the summit of this world class museum with views of all of LA, as well as the Pacific coast, transforms you mentally and physically from the pedestrian/car infested world of an urban metropolis into an environment of intensely designed indoor and outdoor spaces for viewing and appreciating world class art from The Ancients to Futuristic Modernism. I recommend staying late and dining in the hilltop Restaurant. The glass enclosed space affords unequalled night views of the teaming city below. Before heading north to Big Sur - also known as paradise, I highly recommend a quick side trip to a piece of architectural design that is worth the roughly one hour trip to a dreamy section of the southern California Coast in Rancho Palos Verdes - The Wayfarer's Chapel. 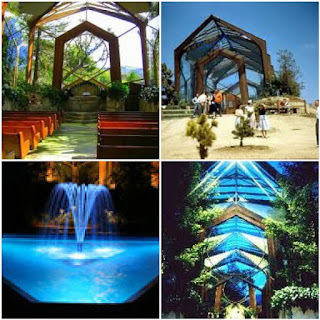 Also known as The Glass Church, the geometrically inspired organic design, by the son of Frank Lloyd Wright, Lloyd Wright, is sited seamlessly within the natural landscape of southern California and built into the cliffs above the Pacific Ocean. As you would expect, it is immensely popular for weddings and other gatherings. It embodies that rare blend of architecture and purpose by creating a space that is architecturally beautiful and spiritually enlightening. After visiting this intimate place of worship, take time to find one of the many small eateries in and around Rancho Palos Verdes for some Nomadic Sustenance before heading north to Big Sur - one of the last unspoiled places of incomparable beauty left in California. Unless you love driving for six hours non stop, I highly recommend taking the trek to the promised land at a slow pace. There are places to see and amazing things to do, so take it easy. Remember - half the fun is getting there. It takes longer, but hugging the coast through Malibu and picking up US 101 just outside of Oxnard will take you into Santa Barbara in about three hours. Once in Santa Barbara, you can check into any number of great boutique hotels for a little R&R and prepare for the trip north. One hotel that comes with a TABLET recommendation is The Presidio Motel, a high quality MCM place sensitively renovated to bring out the California Vibe before the crazies took over. And it's very reasonable at $120 per night. Another reasonably priced TABLET recommendation is Hotel Oceana. It's right on the Pacific and boast two pools. Today you will be a full blown tourist, complete with all of the oohs and aahs that any normal human being expresses when faced with a true man made marvel. So hit the road early to beat the crowds at one of the most amazing architectural gems of California or anywhere else in the world for that matter- The Hearst Castle. Tour reservations are highly recommended. I normally shy away from tourist destinations, but this great house perched on the Pacific Coast of San Simeon is a must see for architects and anyone that wants to see how grand living was like by the uber wealthy and glamour set of the twenties and thirties. Heading towards one of America's most famous homes, you begin to see some of the spectacular scenery unique to the California Coast. You can go via an inland route for a quicker trip, but if you want to relax and enjoy the ride, stay on US 101 and US 1, also known as the Pacific Coast Road, for a visual road trip second to none. As you turn off The Pacific Coast Highway onto Hearst Castle Road, you become acutely aware of this unique landscape that came to be the ultimate playground for the rich and famous of the day. Such political and Hollywood luminaries as Charlie Chaplin, Clark Gable, Charles Lindberg and Joan Crawford were regular invited guests. Even the great Winston Churchill spent time in this grand castle, which served as the inspiration for the Xanadu mansion in the Orson Welles film Citizen Kane, a fictionalized account of the newspaper magnate William Randolph Hearst himself. What started out as a simple bungalow was developed into one of the most interesting studies in opulent residential design ever built. At 90,000 square feet, The Hearst Castle is not so much a house as a dream like confection of eclecticism rarely seen in houses of this scale. As the story goes, Hearst contacted the architect Julia Morgan to "build something upon the hill at San Simeon. I get tired of going up there and camping in tents. I'm getting a little too old for that. I'd like to get something that would be a little more comfortable". And a little more comfort he got! Design and construction started in 1919 and continued without ceasing until 1947. Costing $200 million in today's dollars, this eclectic, over the top mansion contained fifty six bedrooms, sixty one bathrooms, nineteen sitting rooms, one hundred twenty seven acres of gardens, indoor and outdoor swimming pools, tennis courts, a movie theatre, an airfield and the world's largest private zoo. Exotic animals can still be seen today. Morgan, a civil engineer as well as an architect, designed and directed the construction of a gravity-based water delivery system which transports water from artesian wells to provide fresh water for the entire castle, including the iconic outdoor Neptune Pool. Architectural critics have and will continue to debate the aesthetics and impact of this opulent house. However, the mammoth accomplishment and the visionary effort by owner and architect cannot be debated. As we pulled away to head north on US 1, I was reminded of the definition of architecture by the nineteenth century art critic John Ruskin who said "Architecture is the art which so disposes and adorns the edifices raised by men ... that the sight of them" contributes "to his mental health, power, and pleasure". Stylistic arguments aside, after roaming the Hearst Castle, I would say that Ms. Morgan got it right. Up next, California Road Trip Part Two. This Week's Video Artist - The Eagles - Combining great writing with tight instrumentals and vocals, no group captures the essence of the real and unreal of California than this band from, guess where? LA. So which is it? Art imitates life or life is just one big marketing trick. 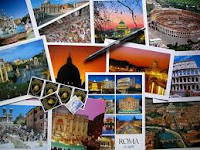 The art of travel is one of life's activities that can educate us, enlighten us, and change our perspective. It can even cause a paradigm shift in our view of the world around us and become as meaningful as a Picasso, Beethoven's Fifth or Notre Dame Cathedral. A paradigm shift is a very scientific event that proves beyond any shadow of any doubt that your previous notions were simply wrong!! It's kind of like - after viewing even a few minutes of Jersey Shore - you have a "paradigm shift" about the future of western civilization. Well, travel can have the same effect - only in the opposite direction. This blog is dedicated to the proposition that travel should not, indeed, cannot be just getting from Point A to Point B. No. Where you stay and what you experience at Point A and Point B and all points in between must be exceptional in every way. In simple terms - Design Matters! It's Not Just About Looking at Great Buildings!! Don't get me wrong. As an architect, I am and will always be interested in great buildings, old and new. I studied every square inch of I.M Pei's Glass Pyramid at The Louvre, as I slowly worked my way to viewing the Mona Lisa. I later discovered that the ficticious "Holy Grail" of The Davinci Code was buried beneath the inverted pyramid in an underground shopping mall. That rather bizarre twist of artistic license is worth at least a couple of theological seminars. And in the most beautiful city in the world, who has not been enthralled with the iconic Eiffel Tower - an architectural monument that was supposed to be temporary and was utterly despised by the citizens of Paris at the time. When you think about it, most travel is centered around great works of ancient and modern architecture. But great architecture is only part of our experience when we travel. No. The small places we sleep, eat, rest and relax in are the ones we burn into our consciousness. Those permanent visions of intimate spaces and places with people we care about become mental and emotional links to love, joy and simple pleasures that travel brings. I once had a discussion with a close friend who told me about a special place she and her husband found hidden in the rocks of Big Sur when they were very young. She described, in great detail, the wine, the picnic basket, the surf pounding on the rocks and the closeness she felt with her husband as they experienced this particular place and how she still remembers every detail about it, even thirty years later. It's those kinds of experiences that we hope to help you find as you plan your travels, be it around the world or down the street. Vow Today - I Will Not Settle!! If you want to find the best - not necessarily the most expensive - places to eat and sleep, you have to develop a curious mind set and the tools to accomplish the task of good travel planning, while allowing for the unexpected pleasures that come to people who just don't like tours, crowds or group think. If I have to choose between a 2,000 room "resort" and the rental car - roll down the windows. In my constant search for unique places of architectural character with design as a central component, I have developed a partial list of Places that I Want to Sleep Before I Die. Disclaimer - I have NOT stayed at any of these places - but I will - unless time runs out! They are completely unique and, in some cases, require you to change your attitude about travel. They have been researched to the extreme - i.e. - I have read every possible review and studied every piece of information I could glean from the web, books and any other source I could find on each place listed. I started with the most expensive place on the list. Prices range from $600 to $1,400, depending on season and view (Mountain or Ocean). 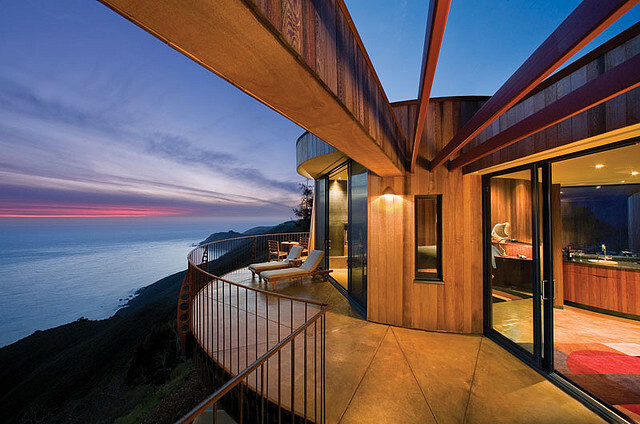 Big Sur is one of nature's true wonders for romantics and nature lovers. After studying numerous reviews, drawings and photographs of Post Ranch Inn, it is clear that Architect Michael Mueinning did all the right things when he inserted forty unique rooms, suites and houses into the rugged Big Sur Coast, some 1,200 feet above the Pacific, to create what has been referred to, by many travel publications, as the most romantic small hotel in the world. So, if money is indeed no object - and you really want to impress the one you love - this is the place!! A sweet little, funky re-birthed 50's motel in an inspiring desert landscape can be had for a paltry $145 to $175 per night. I felt like I owed it to any Broke Nomads after the Post Ranch Inn to provide a very cool, very funky alternative place on the cheap!! 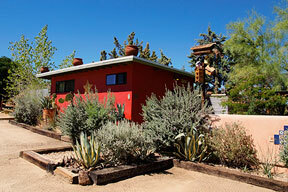 It has that Route 66 Vibe and all the quirkiness and soul you would expect from an artist turned hotelier!! These are the actual instructions, from the hotel website, on how to get to this luxury hotel and spa on the Pacific Coast of Mexico - A 3 hour flight takes you from L.A. to Puerto Vallarta. A quick drive gets you to Boca de Tomatlan - the last beach you can reach by car. From there it's a 30 minute boat ride along the beautiful coast to Yelapa. We will be waiting for you at the beach with our mules to take you and your luggage to our hillside location. If you need a mule ride, please advise us prior to your arrival. A place that requires that kind of logistics just to get there has to be good. 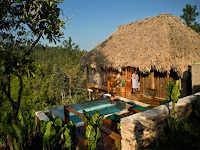 Designed by Heinz Legler and Veronique Lievre, a former movie set builder and set decorator respectively, this heavenly little eco-hotel, carved out of the Mexican jungle with uninterrupted views of the Pacific should make you forget about the traffic and the tasks of your workaday life back home. They say the food is to die for as well. Like great Texas singers/songwriters Lyle Lovett, Robert Earl Keen, Norah Jones and Delbert McClinton, Texas has produced some talented, regional architects who have created a varied body of design work that combines the uniqueness of the Texas landscape and culture with an often austere, stripped down form of regionalism that is visually stunning and spatially diverse. One such place that must be considered is The Hotel San Jose' in the heart of The Live Music Capital Of The World. According to former guests, The San Jose' is everything you don't want in a chain and less. With minimalist interiors and enticing exterior courtyard spaces and easy access to South Congress Avenue and all the live music you will ever need, The Lake Flato Architects' designed San Jose' is a must for people who want to feel comfortable and cool at the same time. Because Florida is such a huge tourist destination, it actually has fewer small, boutique hotels than you would expect. 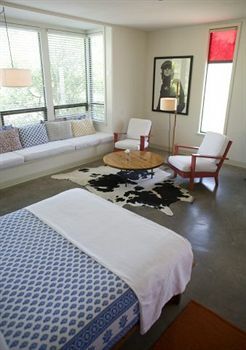 However, The Postcard Inn, a very cool, funky little renovated 1950's motel is a step in the right direction. As Travel+Leisure Magazine says - True to its surfer-cool, 1950’s-motel roots, the new Postcard Inn, in St. Pete Beach, Florida, is hip, affordable, and resolutely casual. Saint Pete Beach, like other West Coast and East Coast Beach destinations such as Daytona and Fort Lauderdale, is slowly making its way back to the Pre-Disney/MTV Days when they were centers of the Party Hardy Universe. 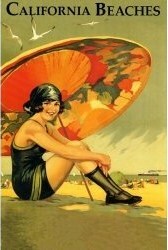 A great time on a great beach can be had for about $175 per night. And the choices for food are infinite, including a great little on site restaurant. Francis Ford Coppola, the iconic movie director, is working the same magic in the hotel business as he did with the revival of the Inglenook Wine Brand into a world class Winery. 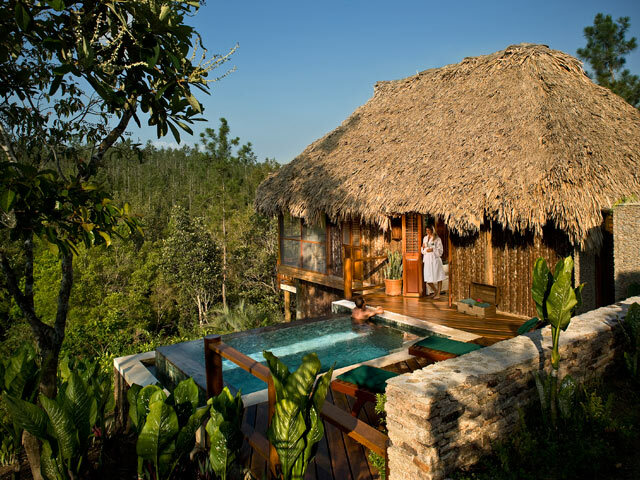 Blancaneuax Lodge, located in the Mayan mountains, is a destination with incomparable natural beauty and cabanas and villas that leave no detail to chance for the Demanding Nomad. It's eco-travel for people who want the very best. The on site food is reported to be local and excellent and you will have a world of interesting eco-oriented things to do when you're not enjoying the exquisitely designed sleeping quarters. 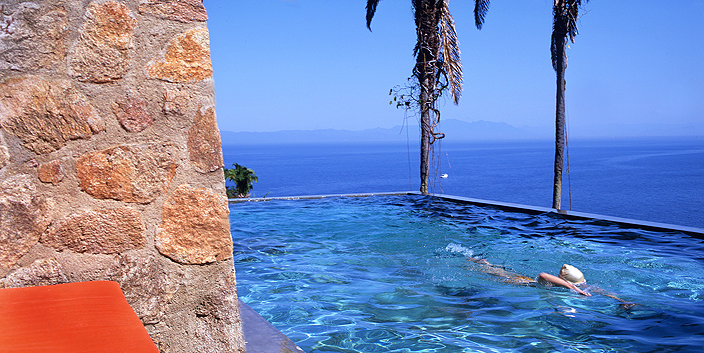 Some even have their own private plunge pools! Great destination for the Romantic Nomad. After you pay a virtual visit to Toscana Rustica, a boutique hotel web site dedicated to a group of small, intimate hotels, converted barns and other unique places to sleep, you will want to take the first plane to Florence, grab a Smart Car and head to one of several properties located in the enchanted land of romance, great food and great wine - Tuscany. One such property is Il Cortile, a romantic little place nestled into the hillside of the picturesque village of Taponecco. With a very cool design featuring sensitive restoration of an ancient group of buildings and spaces you will not want to leave. And its in the heart of a part of Europe that practically invented great food and wine! Nobody inserts modern into ancient like the Europeans. And nobody does it better than the French. Bastion Ste. Anne is just such a place. 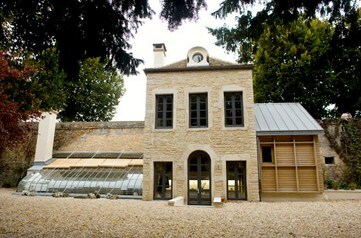 The architect has overlaid this 13th century fortress, in the heart of Burgundy, with minimalist interiors and crisp detailing that will ensure that you will long remember this unique "house". When is the last time you slept in a place that sported a loft for viewing, a glass greenhouse with a monster fireplace for relaxation and a Bulthaup Kitchen to create your own culinary delights? And you have your very own orchard for al fresco dining. If you listen closely, you might hear a couple of Dukes discussing exactly where they planned to place the wine cellars. With one of the most robust economies in the European Union, tiny little Estonia brings us an amazing boutique hotel and spa. Padaste Manor is the essence of living large on a small scale. Combining a world class hotel with an equally impressive spa, this sounds like a place you could get lost in. With a history dating back to 1566, this rural manor has been developed into a destination for Nomads that covet world class pampering. So grab your mate and take off to this little place in a little country in the hinterlands of the EU for some serious R&R. Arrival by sea plane, fly fishing, kayaking, hiking, horseback riding. It sounds like a veritable Ernest Hemingway cure for writer's block. Except you sleep in a tent. And not just any tent. No. If Versace had been a tent designer, these are the tents he would have designed. Classic white canvas enclosures resting regally on raised wooden platforms in the heart of the Canadian Wilderness. I was a Boy Scout until I discovered girls, and I don't ever remember any tents like these. With thermostatically controlled wood stoves, some even have en suite bathrooms. With only twenty tents, it's a Nomad's answer to the great outdoors with a little Waldorf thrown in so you can get your needed rest for a plethora of unending eco-activities. So, if you think you might like to be a jetsetting Eco-Nomad, then, by all means, grab your gear, hitch a ride and head for the woods. So, there you have some ideas that, hopefully, will help you in your quest for that one in a million place you and yours are searching for. That's really what travel is. Thoreau said most men lead lives of quiet desperation. Not so of stalwart seekers of real experiences and mind shifting travel to enlightening environs that you never knew existed until you actually experienced it. To paraphrase the hit song by Oleta Adams: You can get there by railway, by trailway, by airplane, by caravan - it doesn't matter how you get there - just get there if you can - and - I would add - Set a spell once you do! This Week's Video Artist - Lyle Lovett is a true American Original and, in this week's video set, he is joined by the likes of John Hiatt, Joe Ely, and Guy Clarke on one tune and Randy Newman on another. Just great stuff for surfing the net while you find cool places to go. 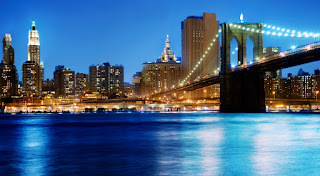 A Little Hotel in The Big Apple - And This time We Took The Kids!! New York. The Big Apple. The Empire City. Gotham. By any name, the melting pot that is New York has more "stuff" packed in its five boroughs than any place you will ever visit. From Broadway to Brooklyn, from The Upper West Side to Coney Island, New York has every nationality, taste and experience, good and bad you could ever want or not. From the gaudiness of Times Square to the uber hipness of The East Village, The City That Never Sleeps has everything from high culture to low and everything in between. It also has some of the greatest hotels and buildings in the world, including the greatest, most poetic of skyscrapers - The Chrysler Building. 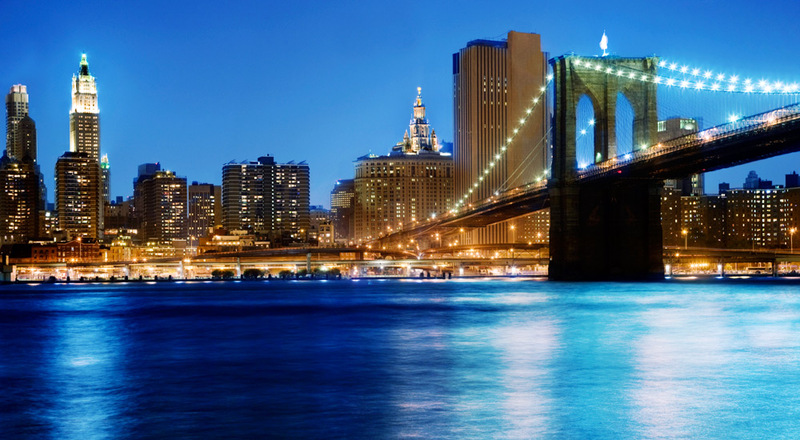 From its bloody and violent beginnings, New York rose to become the financial and cultural epicenter of the free world. Like the song says - If you can make it here, you can make it anywhere! As our kids began to grow into adulthood and the possibility of far flung living arrangements became reality - Our son lives in Atlanta, our daughter lives in Austin, and we live in the hinterland of Madison, Florida - We decreed, sometime back, that we would take a trip at least once a year to celebrate as a family. Since our kids were small, travel has been an integral part of our experiences as a family. Today's post is about just such a trip we took to the Island of Manhattan to celebrate our daughter's twenty first birthday. Travel with adult kids - and they will ALWAYS be kids - in some ways, is more trying and stressful than traveling with actual little kids, because, they now have lives, jobs, school and most of all, opinions!! Just planning such a vacation is the equivalent of a NASA mission to an unnamed planet. And it becomes even more of a logistical challenge when everyone lives in a different place. So after getting flights from Tampa, Orlando and Tallahassee to the epicenter of insane air travel, Atlanta, finding each other, enduring an embarrassing accidental spill of a BIG coffee at the AIRTRAN gate, thereby ensuring that the eighty plus people waiting to board would have at least a somewhat humorous story to tell friends and neighbors about this guy that spilled this ginormous cup of coffee all over the check in desk at Hartsfield today - Hilarious!!! And needless to say, my loved ones were nowhere to be found as they quickly moved away from me as if they didn't know who this strange man was picking up the now empty Starbucks cup. After some hazmat cleanup by the ticket takers and me, we finally boarded for takeoff. After a quick flight, we landed at JFK, gathered our luggage, hailed a cab and arrived at the boutique hotel The Muse without incident. As you would expect in a high end urban hotel, we were met by a perfectly attired valet and ushered into a highly rendered lobby of plush, highly detailed materials and furnishings to a concierge desk, where we were asked to have a seat and discuss our visit to The Muse and New York and finalize our check in, as our luggage was delivered to our room. The concierge was quick to point out various restaurants within walking distance, as well as other things to do in the second most expensive city in the world - London being Number One. Located in the heart of the Theatre District, The Muse is just off Times Square and a few steps from Broadway. It's also a fairly easy walk to Central Park, one of the great urban parks designed by the Founder of American Landscape Architecture Frederick Law Olmstead. The sophisticated design of The Muse continues in the well appointed rooms with all the trappings one would expect from a one of a kind urban hotel located in the center of all of the action in the cultural capital of the Americas. Since this was to be a weekend trip, we did not waste any time availing ourselves of the many things to do in New York. The helpful concierge was able to get tickets for the innovative, talented, hyper kinetic performance troupe Blue Man Group. With a unique combination of cutting edge music, acrobatic dancing and unimaginable contraptions made up of various pipes, tubes and drums, the BMG did not disappoint. After the show, we caught a late night dinner at a nearby restaurant and retired to the hotel for a much needed restful sleep. You cannot go to New York without visiting one of the many museums. It seems that a museum or art gallery is on every corner. We decided to visit one of the great museums dedicated almost exclusively to modern art, the Solomon R. Guggenheim Museum. I was particularly interested in the Guggenheim because it is one of the few buildings in New York designed by America's greatest architect, Frank Lloyd Wright. 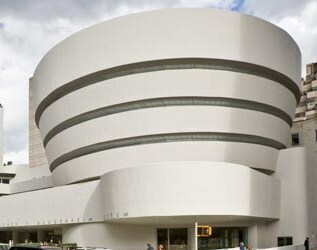 Many books have been written on the amazing, complicated history of how the Guggenheim was designed and built, and the client-architect relationship between the great architect and one of the scions of modern art. 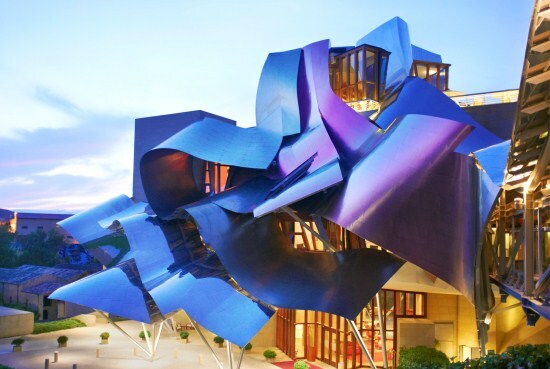 The Guggenheim is a must see for art lovers and architects alike. And its across the street from Central Park. After the museum visit, we took a cab back to Times Square, snagged a window booth at the Marriott Marquis, with a panoramic view of Times Square and celebrated our daughter's entry into adulthood. After an early dinner we headed out for another night on the town. Since New York has more comedy clubs than museums, we decided to check out the legendary Dangerfield's, where new comics test their chops and established stand ups try out new material. Live comedy should be experienced by all, especially at a place like Dangerfield's that books nothing but the best. After a weekend of great food, great entertainment and some amazing memories, we decided to pay a visit to the non-denominational Brooklyn Tabernacle Church, to hear the greatest gospel choir in America. What a way to spend a Sunday morning! I have many recordings by the BT Choir, but, to hear this amazing choir, live, under the direction of the innovative director, arranger and song writer Carol Cymbala was an experience I will cherish forever. What a fitting way to end a great weekend in on of the truly great cities of the world. So Start Spreadin' The News, grab the kids and leave today, or at least by this weekend, for New York, New York. This Week's Video Artist - Who better to represent the music of The Big Apple than world class trumpeter Winton Marsalis, Artistic Director of Jazz at Lincoln Center ? Today's post is the first in a series to be tagged "Quick Cures For The Blue Nomad". Spring has not sprung but it is oh so close! Today, while riding my bike on a recently completed trail in God's Country with a blue, cloudless sky and a balmy seventy five degrees to keep me company, it occurred to me that weekend travel is not only fun , it also brings balance and symmetry to the warp speed of the 24 hour news cycle world we live in. A quick trip to a new or old place, especially one that is unplanned, will shake up your karma and relocate your center. How's that for some New Age hokum!! Anyway, ditch the IPAD, turn off the I-Phone and focus on the road, the place, the food and the one you love. And don't forget your favorite road music CD's or MP3 player. Good Music is essential to any quality road trip. And - NO TV!!! Shake off the cob webs of winter and take to the road for a weekend to remember. Sometime back, we took just such a trip to one of the most enchanting cities in America. Like New Orleans and Venice, Savannah is a city that combines beauty, mystery and eccentricity into a scintillating cocktail of visual, cultural and gastronomic pleasure. Founded in 1733 by General James Oglethorpe, this stylish southern city contains over twenty green city squares. Laden with majestic oaks and all manner of indigenous plants and flowers, the squares provide places of rest and relaxation and give the city a beautiful sense of architectural order. Savannah also has a unique and varied cultural heritage that is very much thriving today. Johnny Mercer, the great lyricist, composer and singer of such American classics as Moon River, Days of Wine and Roses and Accentuate The Positive was born and lived most of his life in Savannah. 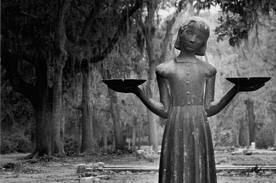 The Southern Gothic book and film Midnight In The Garden of Good and Evil, gives us a glimpse of the eccentricities of this must see place for the curious Nomad. But Savannah isn't just about Victorian houses and old singers. One of the many examples of the contemporary arts and culture scene is The Savannah College of Art and Design (SCAD). With top tier programs in fine art, design, architecture and other creative fields, SCAD is in the perfect environment to produce future movers and shakers in the worlds of design, architecture and allied arts. 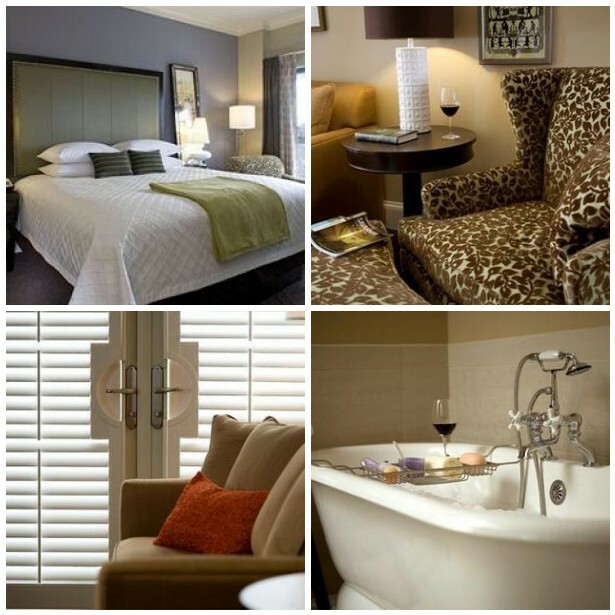 Proof positive that Savannah doesn't live in the past is the small, boutique hotel AVIA. Located in the heart of Savannah's funky downtown, across from Ellis Square, it is the perfect place to wine, dine and explore. The Lady and Sons Restaurant, Paula Deen's famous eatery, is across the street and you are only a block from the waterfront, River Street and more shops and dining choices than you could ever imagine. The Telflair Academy of Arts is a mere three blocks away, if you want to work in a little history and culture. And, Savannah is the perfect city for leisurely strolling, people watching and photography. Getting to Savannah is a fairly easy drive from most southeastern cities. It also has the Savannah/Hilton Head International Airport if you live too far away to drive. We decided to jump off I-95 North and head into Savannah via The Coastal Highway which traverses the Georgia coastal plains region replete with bayous, marshes and long vistas to nowhere. We arrived at the front door of AVIA and were immediately met by a friendly, snappily dressed doorman and ushered into the concierge desk for check in. As first impressions go, so far so good. Once at the front desk, we were met by a smiling, professional young lady who took our first impression and ran with it. She immediately offered an upgrade to a suite from a standard room at no additional charge. Second impression - so far really great. 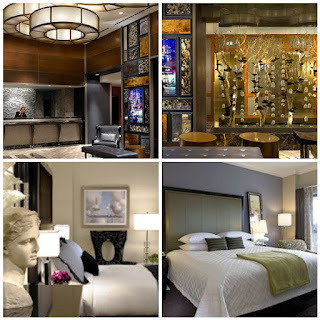 As we completed our check-in and followed the bellman to our room, I was struck by the interior design of the place. I would phrase it sleek urban eclectic. Wow, that sounds like some interior design wag on HGTV, doesn't it? Suffice to say, the lobby, the dining room and the bar are what you would expect in an upscale, urban boutique hotel. Eclectic furnishings with a subdued palette of colors, fabrics and furnishings create serene public spaces that you can settle back with your favorite glass of red or white and enjoy the vibe after a day of walking and sight seeing. The quality of this unique little hotel does not end at the lobby however. Our suite was well appointed with a large comfortable red sofa, large overstuffed chairs and a bed of uncompromising comfort. The bath was also large and well appointed with double vanities and a soothing rain shower. The windows opened to a great view of the treetops of some of the most majestic oaks in the south and the busy Ellis Square below. And the best part of all of this well appointed and understated design quality? The Price. A mere $169.00 will get you a Classic King and $189.00 a Grand Studio Suite. An absolute steal for a hotel of this quality. 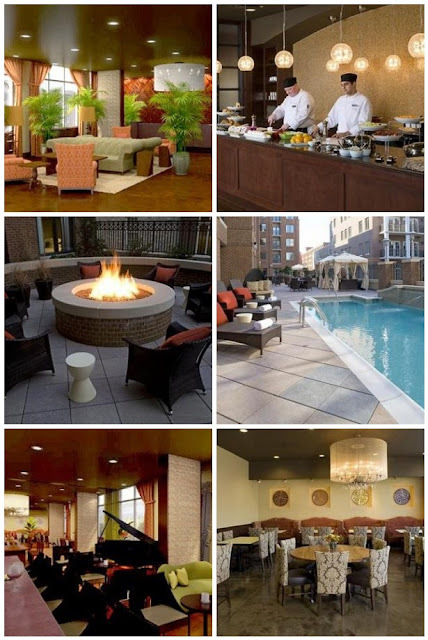 When you take a great little boutique hotel for a ridiculous price and throw in fabulous service, you have a recipe for a great weekend stay in The Hostess City of the South. And the food!! Just like New Orleans and Venice, Savannah is one of those places where it is virtually impossible to get a bad meal. Upon the advice of our loquacious and informative bellman, we decided to check out a small little eatery - The Sapphire Grill. From the Buttermilk Marinated Calamari to the Benne Encrusted Sea Bass to the extraordinary wine suggested by our waiter, the meal at this small, intimate bistro was truly one to be remembered. And the service was excellent. In addition to dining after dark, there are many choices for breakfast or brunch. 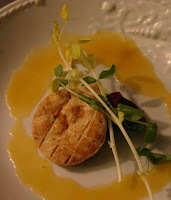 We decided to try the hotel's own AVIA Kitchen and it did not dissapoint. Custom designed killer omelets made with the freshest ingredients and all the sides you need from cheese grits to breads and cool little handmade sweet things to munch on will get your day started right, except you may need a nap before venturing out to enjoy the mysteries and eccentricities of a place that has managed to keep its history intact while embracing the future without flinching. So there you have it - a great place, a great hotel and great food. All you need is yourself and the great person in your life to shake off the dullness of winter and hit the road for a special weekend without breaking the bank.